There was a time when many of us were under the false impression that all bourbon had to be produced in Kentucky. If it’s not made in Kentucky, then it’s not bourbon. That was the prevailing assumption. While the state of Kentucky certainly lays claim to the lion’s share of bourbon on the shelves, it’s never been the case that bourbon has to be made in the Blue Grass state. By law, bourbon can’t be called bourbon unless it’s made in the U.S., but there are no stipulations dictating the exact state of origin. The explosion of craft distilleries making killer bourbon from all corners of the country has helped illustrate that point. You don’t have to have a Kentucky address to make America’s signature booze. And the same can be said for bourbon’s spicier cousin, rye. 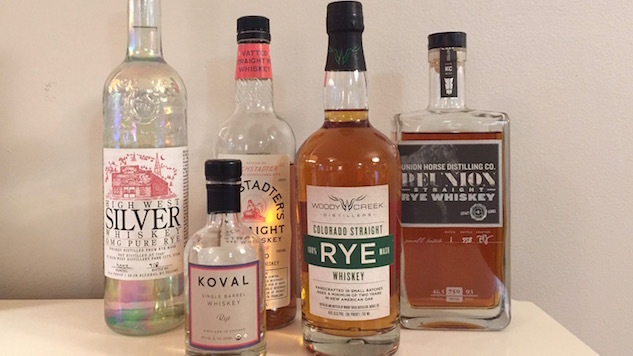 Distilleries from Colorado to Chicago to Philadelphia are making ryes that can rival their southern cousins. WhistlePig, which has sourced most of its whiskey from Canada, is the most obvious and most celebrated of the bunch. But the Pig is just the tip of the iceberg. We found five distilleries making under the radar ryes outside of the Blue Grass state that are completely worthy of a spot on your home bar. Woody Creek Distillers is best known for their potato vodka, an incredibly smooth spirit that’s born from potatoes that Woody Creek actually grows themselves. The attention to detail earned the vodka a double gold at the coveted San Francisco World Spirits Competition. Woody Creek’s foray into whiskey is no less outstanding. This 90-proof rye, which is created from 100% Colorado grown rye, earned its own double gold at the most recent San Fran World Spirits Comp. Colorado Straight Rye delivers the spirit’s signature spicy finish, along with a hint of caramel sweetness, but also a peaty element that’s usually attributed to Scotch. It’s thin, a bit smoky, and sweetens as the ice melts. Chicago-based Koval makes a number of great spirits, including a really good gin we had the chance to try out not too long ago. The thing I like about Koval, is that they pay close attention to their ingredients. As such, all of the grain in this bottle comes from a local organic farmer, while the oak is sourced from just down the road in Minnesota. The result is an organic rye that goes down way, way too easy. There’s quite a bit of alcohol on the nose, which is surprising considering the bottle is only 80-proof, but don’t be alarmed. The sip is almost completely void of that boozy burn that the nose belies. The signature rye spice rules the whiskey when you take it neat; add some ice and the oak comes out to play, along with some hellaciously tasty vanilla. In the spirits world, you don’t get to read the phrase “handcrafted in Kansas” too often, but that is indeed the case with this straight rye. And I gotta say, if this is how Kansas does booze, I’m on board. We’re dealing with another 100% straight rye here, and this one registers at a lofty 93 proof. All that alcohol is hidden under velvety waves of butterscotch and oak. There’s something earthy on the nose, along with the requisite notes of vanilla and a bit of pepper. Surprisingly, there’s less spice in this whiskey than I found in some of the others, so it plays out more like a sweet, soft bourbon. And there’s nothing wrong with that. This rye needs no ice. It’s simply delicious all on its own. If you do happen to drop a hunk of ice in the glass, be prepared for all of the aforementioned flavors to get jacked to 11. This bottle is a bit of an outlier on this list because the Philadelphia-based Cooper Spirits Company doesn’t technically distill the booze themselves. They source barrels of rye, ranging in age from four to 15 years, from all over North America, from Indiana to Alberta, Canada. They bring the various barrels back to Philly where they’re blended into a very mature hooch that’s then aged even further in vats until what comes out is an intense rye with a range of flavors that harmonize better than any boy band on Billboard’s Top 40. The nose is enticingly sweet, and the sip follows suit with a rush of butterscotch and molasses. Hochstadters is 100 proof, but drinks like a cordial, so I think it should come with a warning label. I speak from experience. You’ve been warned. Like Cooper Spirits Company, High West is a distillery that’s known best for sourcing incredibly good whiskey and then making it even better through blending and additional aging. High West has done well for themselves with this model, but they’ve also been busy distilling their own booze, including OMG, an un-aged rye. The mash bill consists of 80% rye and 20% malted rye, which apparently mimics the common mix from the 1800s (High West is a little obsessed with cowboys, but who isn’t?). A lot of un-aged whiskey smells like nail polish and tastes like burning, but OMG has really soft notes of cedar and leather on the nose. And there’s so much more going on in the sip than just alcohol. Obviously, you don’t get the oak or vanilla that you find in well-aged whiskey, but OMG has an incredibly soft mouthfeel, and delivers citrus notes akin to tequila, some mellow sweetness and plenty of pepper on the backend. I even picked up a bit of banana in there. Banana. And it’s 98 proof. I drank it neat, but I’d love to get this rye into some cocktails. An Old Fashioned with an un-aged rye that’s this complex? Why the hell not.